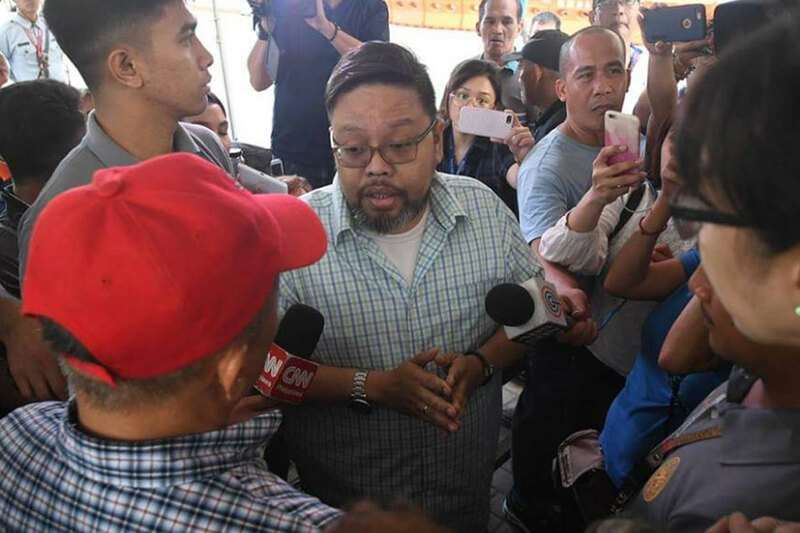 MANILA - (UPDATE) Commission on Elections (Comelec) spokesperson James Jimenez on Thursday confronted a group demanding his resignation. The group, who identified themselves as "Anti-Comelec Smartmatic," said Jimenez refused to answer former lawmaker Glen Chong's allegations of fraud during the 2016 polls. Smartmatic was government's contractor for the 2016 automated elections. "'Yung sinabi ni Atty. Glen Chong na nung May 8, 2016 may transmission na ng votes, kahit May 9 pa ang eleksiyon, hindi niya sinagot 'yan," said the group's leader Troy Abitona. A few minutes before the end of office hours, an upset Jimenez stormed out of the Comelec building to confront the group. Jimenez explained that he already sent his answer during the Senate hearing on poll fraud allegations, but the group wasn't convinced. Asked why he decided to talk to the group, Jimenez said: "I didn't know that they were still here, I'm going to the filing but when I heard them talking, I said 'you know let's talk to them.' They have a grievance, they're members of the public, and they should be talked to so I talked to them. Ganon lang 'yon (That's it)." "Si Mr. Troy Abitona sa isang JCOC (Joint Congressional Oversight Committee) hearing, nilapitan niya ako, nagtanong siya ng mga tanong, sabi niya hindi daw sinasagot. Pinaliwanag ko mga sagot, hindi siya satisfied," Jimenez said after the confrontation. "After ng meeting nagkaroon ng 3 JCOC hearing kung saan nagbibigay ng sagot ang Comelec. It is a public committee, it was a public hearing, the answers were given in public pero hindi siya happy. I guess that’s it," he added. But Chong, who was also at the Comelec office, said he wanted Jimenez to answer the allegation in public so he can answer back point by point. "Nagpadala po sila ng sulat sa Senate, pero ang sinasabi ko, sagutin niyo ako sa publiko kasi sasagot din ako," he said, adding that they have additional evidence to support their claims. Chong also said he told Jimenez about the photo of ballot boxes, bought from Smartmatic for the 2010 and 2016 polls, allegedly left "exposed" outside a Comelec warehouse in Sta. Rosa, Laguna. He said Jimenez told them that the poll body will issue a statement on this issue.